Back in January 2012 I painted a classic Jes Goodwin Imperial Assassin sculpt. 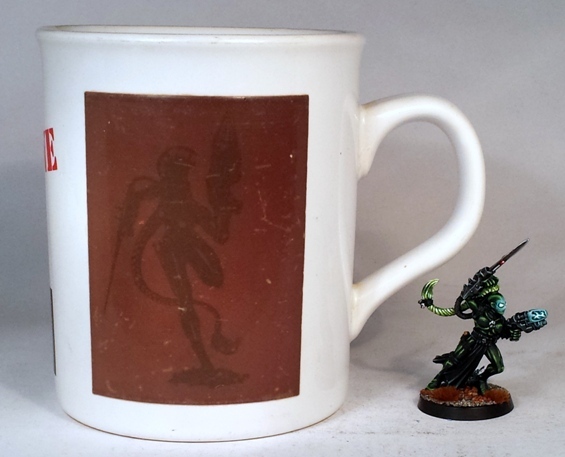 Released a couple of years after the original Rogue Trader era assassins, the design of the model always struck me as being in some respects the prototype for the more specialised temple specific assassins that came later. 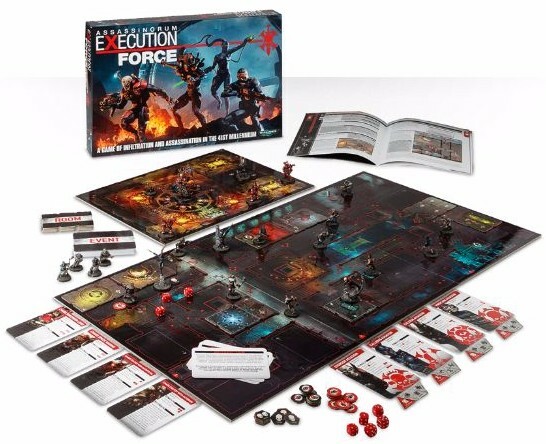 …and then GW released the Assassinorum: Execution Force board game a month or two ago and my enthusiasm for assassins was renewed, hooray! The plastic assassin models in the game are nice, but I painted the earlier models that I already owned instead: they had waited long enough. Interestingly, the design of the new assassins and their equipment has remained almost identical to the designs dating from the mid-nineties. 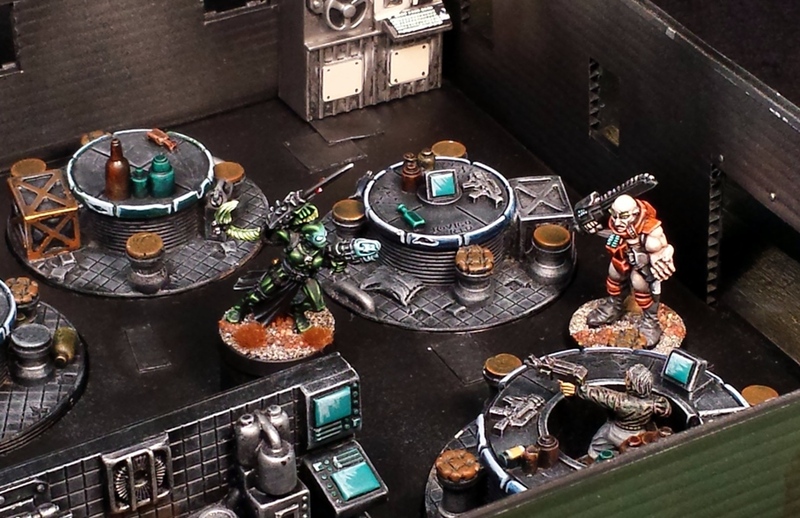 The Vindicare sets up his shot. 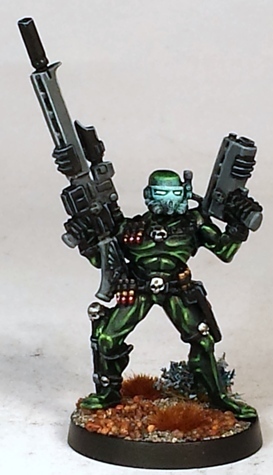 Possibly my favourite of the Assassins is the Vindicare, the sniper. 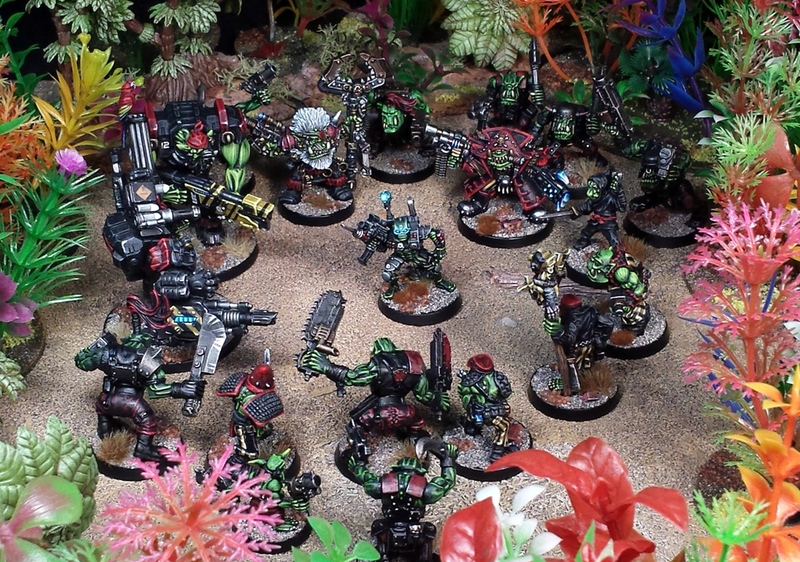 Its probably the least identifiably 40K model in the group, with few gothic stylings. Of the four models this is the one that would blend in to another game system without looking too off, assuming that the other system had the same interest in gigantic weaponry of course (but most of them do). The operation on Eylea went as planned: eighty seven ork casualties upon operative extraction. The Eversor assassin – a psychotic berserker – has previously not appealed to me very much. The large skull face looked a bit off to me, particularly when painted to look like bone, so I decided to paint it to match the rest of the synskin suit. Slightly unexpectedly I quite enjoyed painting this guy. 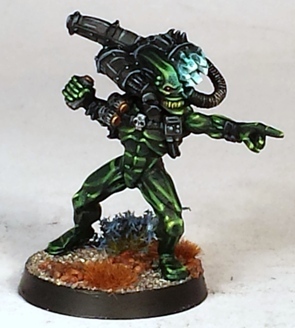 It is probably my second favourite of the finished models in the group. The Callidus – the shape shifter – has a faceless look to her that I like, but the humongous pony tail has long struck me as rather an odd thing for a shape changer to have to deal with. Not that I am going to let something like that stop me of course. I had a little trouble painting some of the areas on this model and I overdid the OSL effect on the face I think. Its more than serviceable, but it didnt turn out quite as nicely as I had hoped. Note the silhouette concealed behind the heat sensitive “polymorphine”. 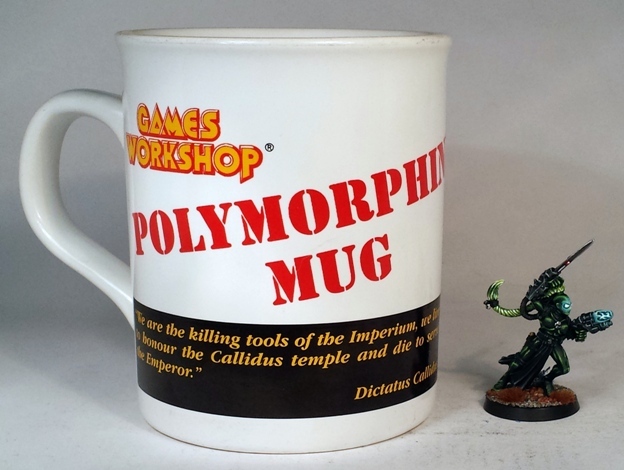 The name of a chemical compound crucial to the temples shape shifting abilities (“polymorphine”) has been familiar in my house since the nineties, when I got this heat sensitive mug for subscribing to some GW publication or other. Not a massively exciting fact I know, but I felt that it was pertinent here, so what the hell. 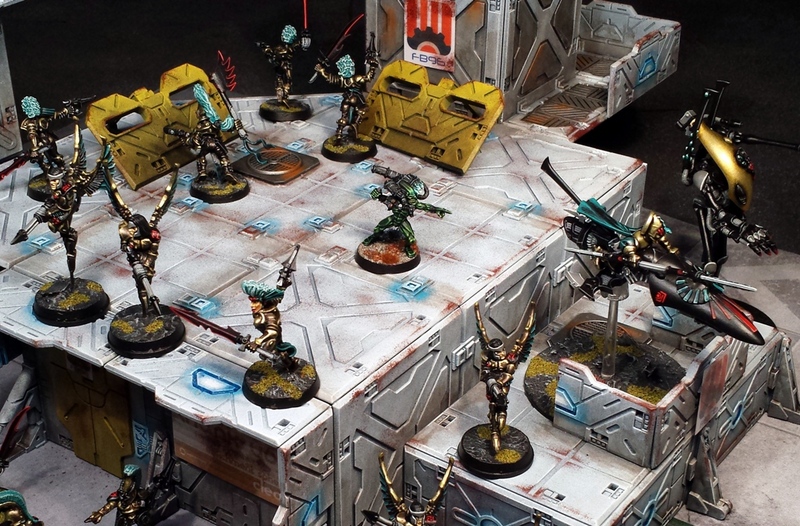 Being both blessed and cursed by their psychic sensitivity, the Eldar of the Iacon Confederacy are all to happy to obey the order to retreat when the Culexus drops in. The Culexus is the anti-psyker assassin, a carrier of the Untouchable/Pariah gene uniquely suited to wearing a Mardi Gras float as a hat. Oddly, although my least favourite of the GW assassins at the start of the project, primarily due to the skull face motif and gigantic head, I found that I also enjoyed painting this model far more than I expected. I even ended up enjoying the weird, arcane and massive “Animus Speculum” helmet and “J’accuse!” disco pose. I cant decide if I like the Eversor or the Culexus the most now, an inversion of what I expected to happen. Eight walnut cracking buttocks side by side. let the enemies of the Throne beware! The black outfits are fine and all, but they seemed a bit pedestrian, so I went for green. The blue and green give a sort of spec-ops vibe I think, like a Tom Clancy Splinter cell sort of feeling that I think is appropriate. As I said in the post, the Culexus went from being the one that I didnt really want to paint to being the one that I like the most now. Its funny how that can happen. I hear a loud “J’ACCUSE!” I’m my head whenever I look at that guy. Whatever it is that the guy is doing, he feels strongly disco about it. Thanks for the feedback Captain, I’m glad that you like them. Thanks for the feedback No Such Agency! Incidentally, the approach you took here would probably work well on that CP Miniatures figure you sent me. She’s very reminiscent if these guys. Your razor sharp insight has spoiled the potential surprise NSA 😉 That range of CP figures is precisely what I intend to paint to match these assassins actually. I’m looking forward to painting those nice PF sculpts and I think that this scheme will suit them well. 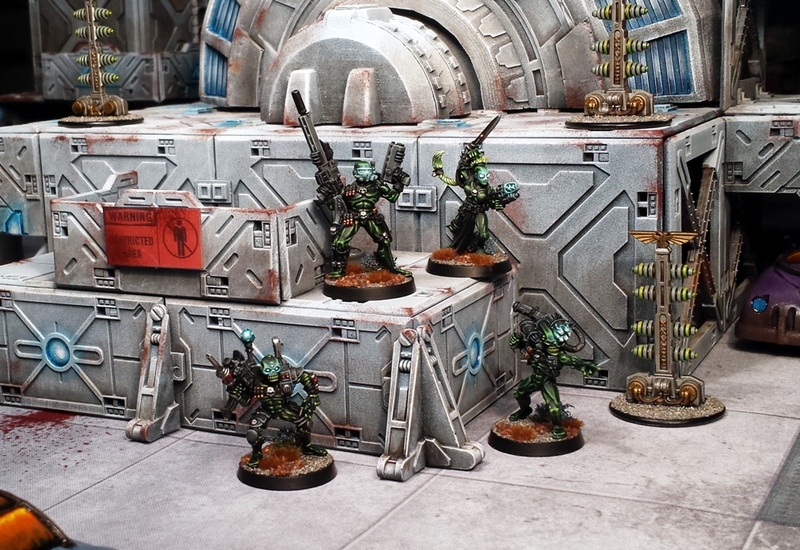 Now that I think of it you have painted some similar 15mm models – skintight sci-Fi types in a similar green haven’t you? 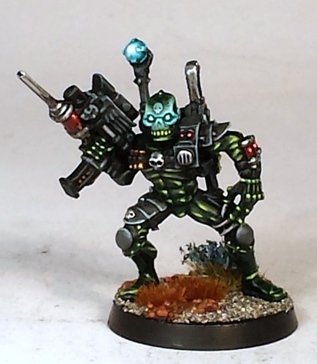 I did one in grey/black with green OSL, yes. A similar effect but only on her back/shoulders. I have been trying to get OSL to work out over the last six months or so and after a few false starts its improving a little each time that I do it now. 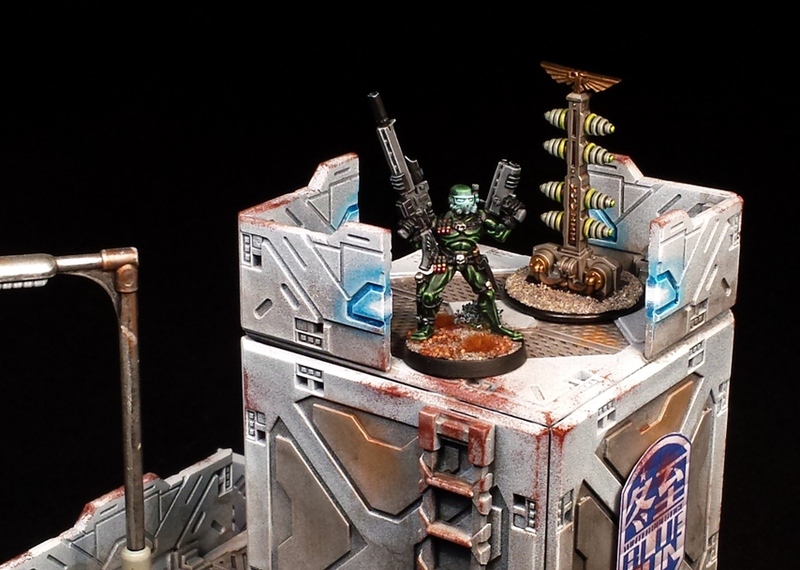 By and large its close to a level that I am happy with on these miniatures. Part of the process for me is always to try to simplify the approach as much as possible too – Im less of a perfectionist than many of the spectacular painters out there and output/turnover is king – so that can cause an occasional step backwards. Like all my toy soldier painting, the techniques are a work in progress. I am pleased with the overall look of this crew though. As ever, thank you for the feedback! Thanks model warrior, the palette did work out nicely on these. These are beautiful, the extreme highlighting suits them perfectly. 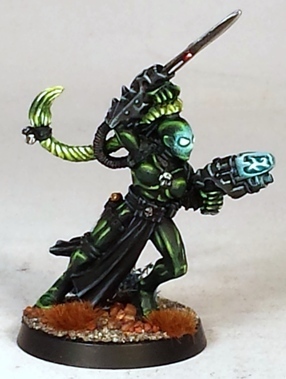 The eye glow and green highlighting make for some very striking minis. Gawhgeus! I tend to paint most miniatures more or less the same way, but that obviously tends to suit certain sorts of model designs better than others. It suits these designs better than most I think. The palette worked out so well on these guys that I am planning to add some more skintight green clad colleagues to them at some point. Sooner rather than later I hope. I have plans, lets see how they survive contact with real life. Get job on the OSL, it’s quite tricky to know how far to go with it I reckon. I usually end up applying too much & then just settling for it looking to bright. It is hard to get a handle on how heavily to apply OSL, Im still very much feeling my way around the process. Like weathering its a bit risky taking a step like stippling on to a fully painted area when it is extremely difficult to fix if you screw it up. But nothing ventured nothing gained and all that. Just realised that I said “get”, I meant “great”. Damn auto correct! I applied too much OSL to my RT Beastmen last week, but -like you said- once you’ve done the deed there’s no going back. I think what I’m going to try doing from now on when I want to attempt weathering or OSL is to finish off the minis normal paint job first, then varnish it & then weather/OSL it. That way, if I screw it up I can just clean it off & start again. That’s an interesting idea. What sort of varnish do you use and how would you approach cleaning off an error? It would be delicate work but if you had a way to manage it then that would be fantastic. I’m not 100% sure how I’d do it when weathering with acrylic paint. I’d imagine that try varnishing it with an oil based gloss, to give it a really good seal. Then the subsequent applications of paint could be cleaned off with something like “Acetone free nail polish remover”. Then, once your happy with it you can hit it with a matte to take the shine of it. I’ve had success with using polyurethane gloss varnish before. But that was when I used benzene & oil paint to weather my Helsreach walker. That worked a treat. I’ll do a bit of experimentation with the former method. I don’t comment here nearly enough, but these are fantastic, and they blend perfectly with your new scenic elements! The assassins did work out pleasingly. I definitely aim to add a few more before I call them done.